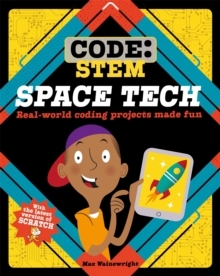 Discover how today's amazing inventions and technologies work while developing your coding skillsRecreate the technology that lives in space technology with code. Learn aboutgravity, create a jetpack game, program a spaceship's return to Earth and much more!Each book goes inside a different machine or technology and explains the key computer code and systems that are controlling them. Step-by-step activities teach you how to create your own versions of these machines on screen, and bring them to life - with code! The focus is placed on modern technologies that actually use code to work, rather than looking back at steam engines, etc. This will keep the practice of coding firmly in the contemporary. The series uses Scratch as the coding language, as this is still the most used, user-friendly and flexible in building projects, however no prior experience of Scratch is expected and each book will include an introduction to Scratch. Perfect for exploring STEAM and other high-interest topics. Great for reader 9 and up.